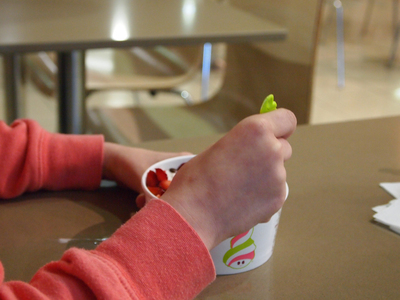 If you're looking for a fun family activity, frozen yoghurt probably won't be the first thing that comes to mind. 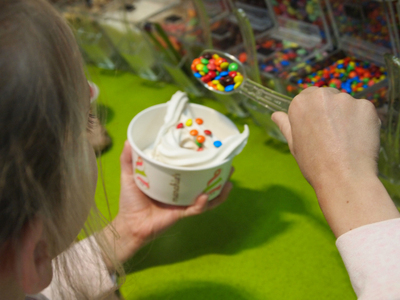 Yet somehow Menchie's Frozen Yoghurt in the Myer Centre is just as fun as it is tasty. The idea is simple: you pick a small tub, fill it with your favourite flavours, add toppings like fruit, nuts, lollies, or chocolate and then weigh the whole thing once you're done. 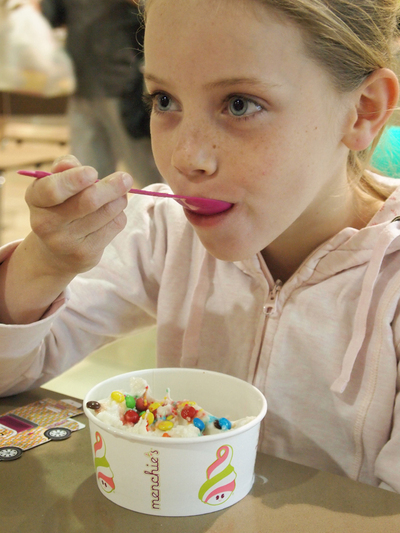 Kids can take charge of the whole experience themselves: pulling down the lever to get their frozen yoghurt, scooping out toppings, and even putting it on the scale at the end. Of course staff are also friendly and helpful, so they can run you through your first time. There are endless flavours to choose from that change over time. You can always expect to find something new in store. It might mean that a favourite flavour isn't always there, but at least it keeps things exciting. 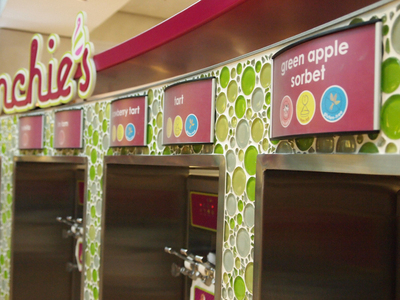 Some of their flavours include: cookie's 'n' cream, blueberry, cheesecake, banana, birthday cake, vanilla and more. You choose what you want, and how much you want. 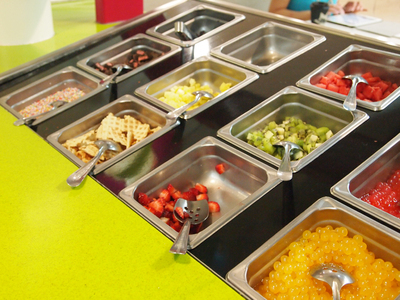 It gives kids a chance to show their creativity with flavours and toppings. Thankfully most things go together, so you can avoid most disasters, but you might discover you've got a mini Heston Blumenthal on your hands. It's a good idea to keep a close eye on kids as they fill up their cup. 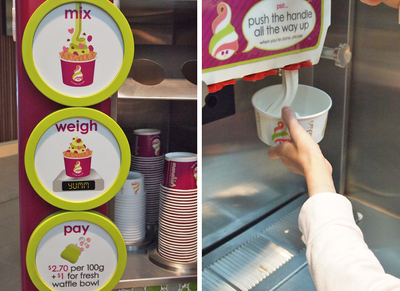 Once you've finished choosing and adding flavours and toppings it's time to pay. 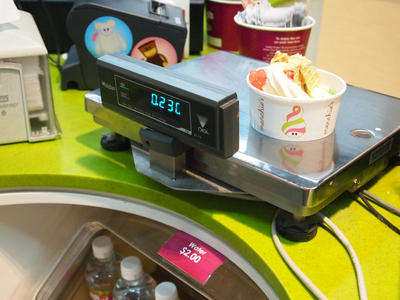 The Menchie's staff will weigh your cup and you pay according to the weight. If anyone's gone too crazy down the line you might not expect the final price. We generally pay between $5-$8 per cup. 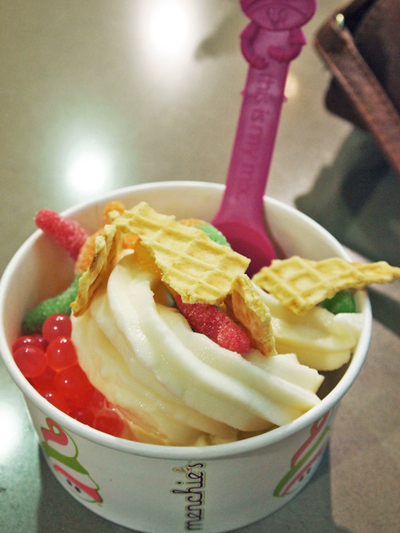 Menchie's even have their own range of fro-yo themed characters. They've always got a supply of stickers and other bits and bobs to hand out to kids. It makes the whole experience a bit more fun compared to just buying an ice cream nearby. The store is open during the regular Myer Centre Food Court hours. Monday to Thursday 9am till 7pm, Friday 9am till 9pm, Saturday 9am till 5pm and Sunday 11am till 5pm. There's usually plenty of seating in the food court, but because the frozen yoghurt comes served in a cup not a cone they're a bit easier to transport; try taking them across the road and having a mini picnic on the gardens along North Terrace. Check out their Facebook page for special offers. 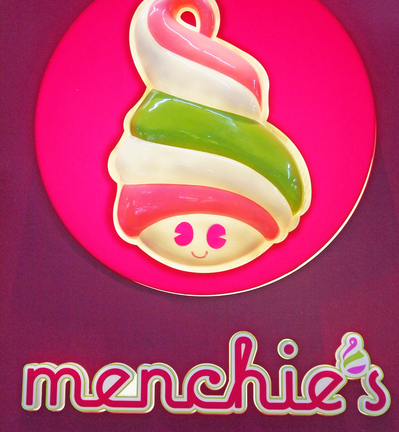 Have you tried Menchie's yet? What do you think? What's you're favourite combo?